Posted by Wairimu in Fish & Seafood, Wairi's World, What's cooking? So it has occurred to me as I’ve been sitting in front of my laptop for the last I don’t know how many hours, and haven’t managed to get any work done, that being in this flat all alone isn’t as fun as I thought it would be.I mean there are the perks like I can run around naked, eat all the food in the fridge etc… these are all fun, but there is something missing! It isn’t the lack of hot water, no, it’s a lot more necessary than that. This thing I’m missing is actually two things… or two human: Gathoni and Shaun (Faun or Shaith if you prefer). Since they up and left me, promising to come back (graduates are quite flaky aren’t they? ), I’ve been suffering from what they call abandonment issues. Even though we still talk, it simply isn’t the same, and i sometimes resort to looking at your photos on facebook and pretending Shaun has told me a dry/funny joke when reading his blog.. it just isn’t the same! Season salmon with ¼ tsp salt and some pepper. Beat the ingredients for the tarragon butter together in a bowl. Heat 1tbsp tarragon butter in a large pan, add a handful of spinach, as soon as it starts to wilt, add more spinach. Cook for 1minute over high heat, tip into a colander and drain excess liquid. Roughly chop on a board and leave to cool. Roll block of pastry on lightly floured surface into a rectangle about 4cm bigger than the salmon fillets. Roll out second block of pastry, 5cm larger than the first one. Lay smaller pastry on a greased baking sheet, and spread half the spinach mixture in the centre. Put one salmon fillet, skinned side down, and spread with the rest of the tarragon butter. Cover with the second fillet, skinned side up, and cover with the rest of the spinach, making sure all the salmon is covered. Brush with egg white a band around the salmon and cover with the second piece of pastry. 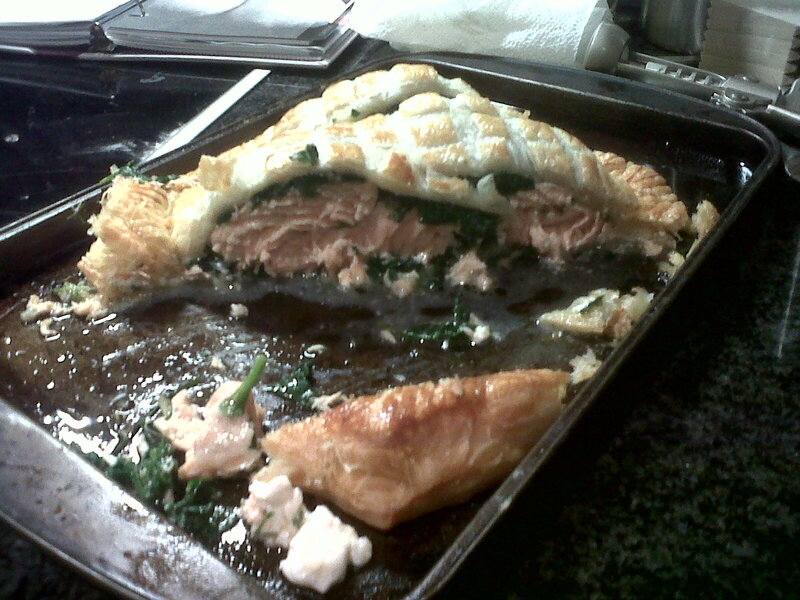 Tuck the pastry in well around the salmon, press the edges together to seal. Trim away the excess pastry and press with a fork. Chill in the fridge for 1 hour. Preheat oven to 200°C. Brush salmon with beaten egg and chill for another 5minutes, remove and brush again with egg. Score the surface of the pastry into a tight diamond pattern with the tip of a small knife. Bake for 30-40minutes. Remove salmon parcel from oven and leave to rest for 5minutes. And you know what there is a third humans I am missing, though she doesn’t come often, but always fun times when she’s here, and the only person who lets me spoon! heehee.. Miss Lydia. Now I’m really bad at making steaks, and she told me that if u sprinkle some chilli on it and marinate it for a while, and the meat won’t be tough.. still working on making the perfect steak for you the next time you come, and how could i forget the duck.. Yup! put that on the list too! Can’t mention past tenants without mentioning the original tenant Jeff (tempted to say Jeff-twizzle, but that’s the wine talking).. Apart from getting stuck in the coffee table and endless entertainment, I do remember the one thing he used to cook me (albeit at 7am and drunk, it was way better than kebabs).. Grilled chicken wings. I can’t remember everything that went into them, ingredients changed depending on what was in the fridge, but essentially, it was chicken wings marinated in sweet chilli, soy sauce, spring onion, peppers, chillies and whatever else was available and then grilled for about 35mins. It was sticky, messy and exactly what the body needs after a night out! So there it is… an empty flat (and empty wine glass) and we miss you all sana sana! like Ali kiba song… ‘rudi home, wewe, rudi nyumbani..’ lazima murudi!! But I suppose, I will see you all over Easter.. I owe you all these great meals! Love you Always, in All ways!